This exceptional contemporary English cast sterling silver presentation piece has been realistically modelled in the form of a Charolais bull. This piece has been embellished with chased decoration reproducing the details of the bull's coat and facial features. The sterling silver bull is displayed on a fine and impressive mahogany presentation plinth fitted with a plain vacant rectangular plaque to one side; the plaque may be engraved with a personal inscription if so desired. The underside of the plinth is fitted with green baize. 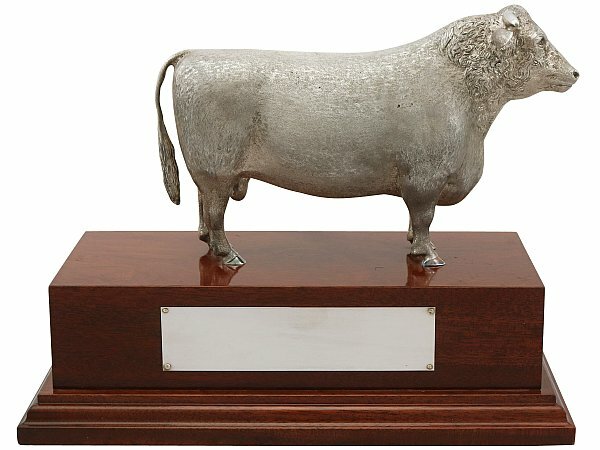 This impressive presentation bull is an exceptional gauge of silver, exceptional quality and in exceptional presentation condition. The cast and chased decoration is very sharp. Full hallmarks struck to the surface of one of the bull's hind legs are all very clear. Reflections in photographs may detract from the true representation of this impressive silver bull trophy. * An exact weight of silver cannot be provided as this piece is mounted on a mahogany base.